Officers notorious for filing false charges, then blackmailing the poor, they say. LAHORE, Pakistan (Morning Star News) – Poor Christians in Pakistan commonly see police target them for extortion on false charges, and last week such a case ended in the death of a 24-year-old Christian, relatives said. On the assumption that Christians with few legal resources can be targeted with impunity in the 96-percent Muslim country, policemen on May 29 killed Waqas Masih when his uncle refused their demand for money after they threatened to file false charges, the relatives said. Police are now pressuring the family to drop the murder case, they said. The slain young man’s mother, a widow who belongs to a Pentecostal church, told Morning Star News that three policemen forced their way into the home of her brother, rickshaw driver Saleem Masih, in in Punjab Province’s Haider Colony, Gujrat District. Saleem Masih had recruited Waqas Masih and other relatives to help him with a construction project at his residence. Saleem Masih’s son, Emmanuel Saleem, told Morning Star News that he and other relatives were sitting in the courtyard of their home when three officers identified only as Shoaib, Shehbaz and Saqib forced their way in around 5:15 p.m.
“We asked them what they wanted, to which they said that they had information that we are drug peddlers and that they had raided the house to recover the narcotics,” he said, adding that the allegation was frivolous as the three policemen were notorious for blackmailing poor people in the area. A heated argument ensued between his father and the police, and they began threatening to file false charges against him and other family members, he said. His two cousins had returned to the house to tell his father what had happened when the policemen arrived and told them to check on Waqas Masih, saying he was “feigning illness,” Emmanuel Saleem said. 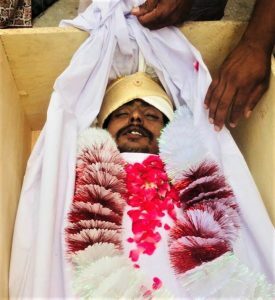 “We immediately rushed toward Waqas and saw him lying on the street, motionless,” he said, adding that he had already died by the time they arrived. Waqas Masih worked as an assistant gardener at a government-run, rural health center. Asked why he had run from the house, Emmanuel Saleem said police often target poor Christians for extortion and file fake charges against them when they don’t have anything to pay. He said this was not the first time local police had illegally entered a home and beat Christians. He confirmed that officials were pressuring the family to “pardon” the accused and give statements in their favor. “We have even been offered money, besides threats to withdraw the FIR [First Information Report], but we have decided to hold our ground,” he said. Gujrat District Police Officer (DPO) Jehanzeb Nazeer, however, denied that the accused officers were pressuring the family. “I immediately ordered the registration of the FIR, and the three accused officials were taken into custody within 72 hours of the incident,” he said, but he added that the officers have not been formally charged with murder as the initial post-mortem report did not reveal the cause of death. “The initial post-mortem report does not state any injury marks on the deceased’s body or the cause of death, therefore we are now waiting for a full report from the Punjab Forensic Science Agency [PFSA] before reaching a final conclusion about the incident,” he said. Initial investigation showed the three officers raided the house on a tip that drug peddlers were present, he said. When asked if the deceased had any criminal record, the police chief said that they had not found any case registered against him. Nazeer denied that the three accused officers extorted money from citizens. The three officders were taken into custody so that they could not influence the investigation or fabricate evidence against the victim, he added.